Pull back husks from corn, leaving husks attached. Remove and discard corn silk. Bring husks back up around corn; tie in place with kitchen string or strips of corn husk. Soak corn in cold water 30 minutes or up to several hours. Combine rub ingredients. For Cumin-Lime Butter, combine 2 teaspoons rub mixture, butter and lime juice in small bowl; set aside. Press remaining rub evenly onto beef steaks. Cover and refrigerate steaks 30 minutes. Remove corn from water. Place on grid over medium, ash-covered coals; grill, covered, 20 to 30 minutes or until tender, turning occasionally. About 15 minutes before corn is done, move ears to outer edge of grid. Place poblano and finger chili pepper in center of grid; grill poblano pepper 10 to 15 minutes and chili pepper 5 minutes or until skins are completely blackened, turning occasionally. Place peppers in food-safe plastic bag; close bag. Set aside. 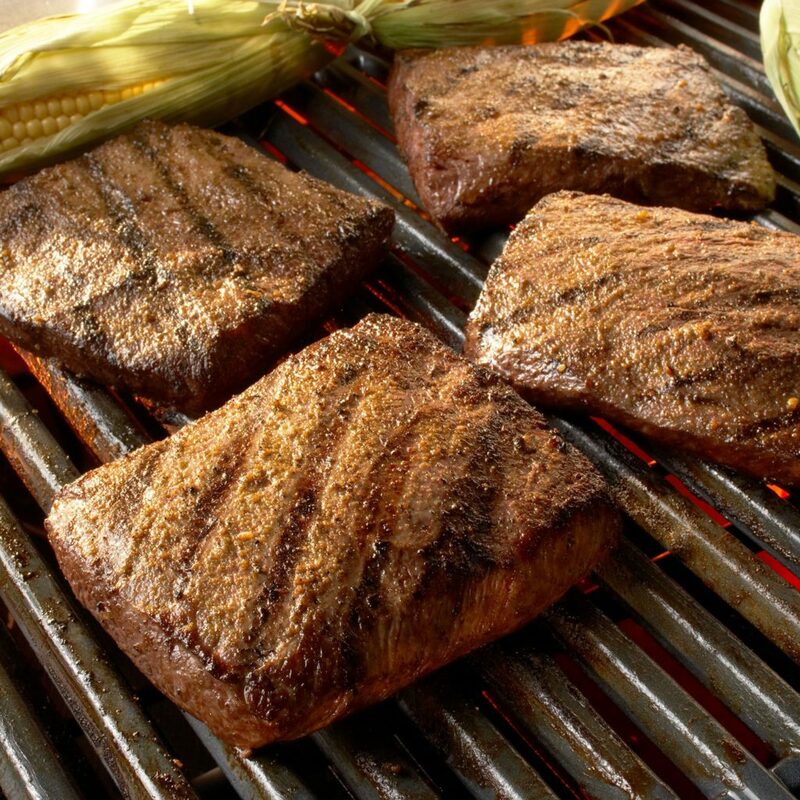 Place steaks on grid over medium, ash-covered coals. Grill, covered, 10 to 14 minutes for medium rare (145°F) to medium (160°F) doneness, turning occasionally. Cook's Tip: To prepare on gas grill, preheat grill according to manufacturer’s directions for medium heat. Place vegetables and steaks on grid as directed above. Grill corn and poblano pepper, covered, 15 to 25 minutes, or until corn is tender and skin of poblano pepper is completely blackened, turning occasionally. Grill finger chili pepper 5 to 10 minutes or until skin is completely blackened, turning occasionally. Grill steaks, covered, 12 to 16 minutes for medium rare (145°F) to medium (160°F) doneness, turning occasionally. Remove and discard husks from corn. Cover and refrigerate 2 steaks, 2 ears corn and grilled peppers to use in another recipe. Carve remaining 2 steaks into slices. Squeeze lime wedges over beef, as desired. Spread Cumin-Lime Butter over remaining 4 ears corn. Season beef and corn with salt and black pepper, as desired. Nutrition information per serving: 333 Calories; 18g Total Fat; 8g Saturated Fat; 6g Monounsaturated Fat; 86mg Cholesterol; 84mg Sodium; 2g Total carbohydrate; 25g Protein; 3.6mg Iron; 4.8mg Niacin; 0.4mg Vitamin B6; 5mcg Vitamin B12; 8.1mg Zinc; 33mcg Selenium; 3.2g Fiber.